Why draping in the first place? Purpose? Draping will alter the overall appearance of the room. It’s very versatile and dynamic. For instance, if the walls are unflattering or the color doesn’t work into your design plan, then add white wall draping and start fresh. Want to add color? 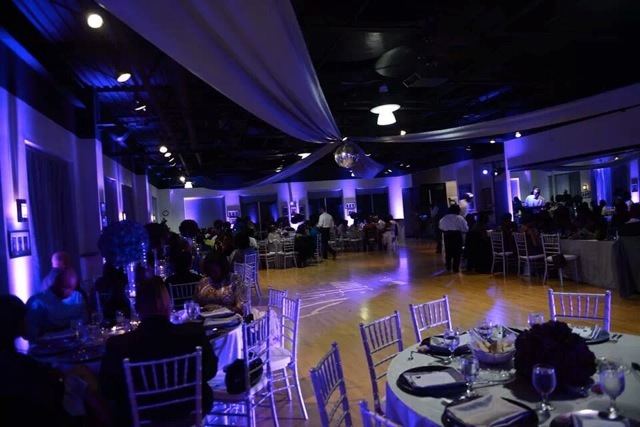 No problem, add LED uplighting and make the walls any color you want. How can draping be used? The 2 main uses for draping are ceilings and perimeter/wall coverage. 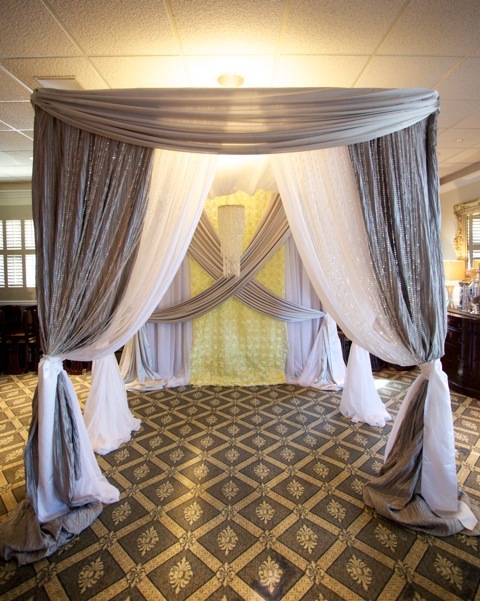 There are many and yet elaborate possibilities for the fabric, however, such as creating head table backdrops, Canopies such as Chuppah’s & Mandaps. The list goes on. Why use Draping if the venue is gorgeous already? In so many words: to create the “WOW” Factor. Watch your guests’ eyes dance with amazement when they see the room transformation. Not only that, but imagine all the stunning pictures your photographer will be able to create. What are the costs for adding draping? Not all draping prices are set the same; therefore, overall costs are sometimes hard to gage. We suggest that you schedule an appointment for us to come out to your venue and do a site visit. From there, we can see build a customized proposal that will be reflective of your space. Now, to give our clients a better idea of costs, I find that average price for white or black wall draping is around $12 per linear foot with set up and take down included in the price. For other colors other than Black &White, pricing is typically higher. Of course, that is the beauty of uplighting. 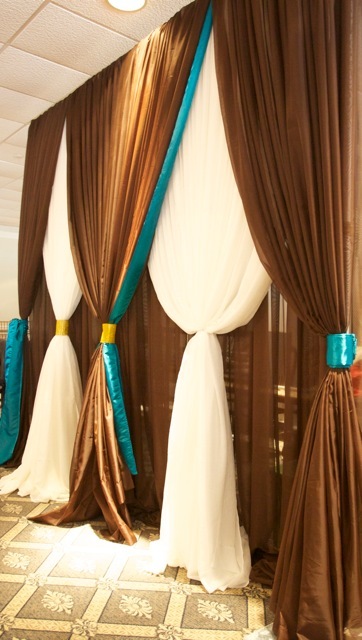 Combined with white draping, we can reach any desired color combination. As for ceiling draping, pricing is definitively higher since there are a few more variables to consider such as ceiling dynamics, hang points, hardware for installation, color style, fabric, design and so on. Average pricing ranges from $1000.00 on up, so this is where I find it best for our clients to arrange a time for us to do a site visit and discuss the various possibilities and find a solution that works best for the set budget. However, not everybody has realistic pricing expectations; therefore, it is very important to understand what goes in to executing a professional draping project and how the costs are derived. Draping isn’t inexpensive in the first place and in order to maintain the look and overall appearance, they must be professionally cleaned. In addition, skilled labor, insurance, transportation and other factors must be weighed in when projecting the overall costs. This is not a DIY project and would strongly urge to leave to the professionals. Not only is this a skilled endeavor, it is a reasonably challenging one, after all, being 12 feet or higher off the ground while performing this creative feat could lead to disaster if safety precautions are not met. 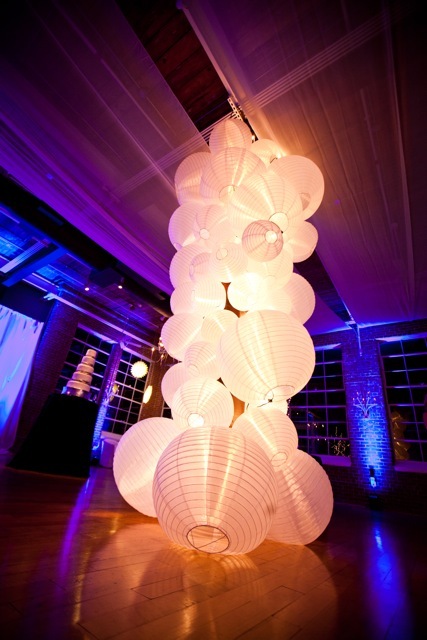 For more information on Draping or lighting, please feel free to give Triad Event lighting a call.